Eleven new small businesses in Southwest Virginia’s e-Region, including three drone-related companies, were approved for seed capital grant match funding at the Oct. 18 VCEDA board meeting. The new businesses involved drone technology services, tourism, retail and restaurant ventures. Each of the 11 businesses was approved for $10,000 in match funding through VCEDA’s Seed Capital Matching Grant program. VCEDA region for-profit businesses one year and younger, creating at least one full-time job, and with less than 10 full-time employees total, are eligible to apply for dollar-for-dollar matching grants up to $10,000 from the VCEDA Seed Capital Matching Fund. Three drone-related businesses receiving funding included Brad Deel Drone Photography & Videography, LLC (Dickenson County); Remote Agri Drone, LLC (Tazewell County), and Praise Aeronautics LLC (Russell County). VCEDA believes these are among the first drone-type businesses to locate in the region (VCEDA added drones as one of its target industries for the region several years ago). Three of the small businesses approved for grants are retail businesses located in Tazewell County: Bargain Mart, LLC; Bliss on Main, and Tazewell Co. Mercantile, LLC. Two are new restaurants — Sharina’s Wingz LLC in Tazewell County and BACO Enterprises LLC in the City of Norton — and two are agriculture-related — McPherson’s Farm Equipment, LLC in Lee County and The Bloom Farm, LLC in Dickenson County. One business is tourism-related, White Mountain Cabin Rentals and ATV Park, LLC in Buchanan County. Read more about the seed capital grant recipients. 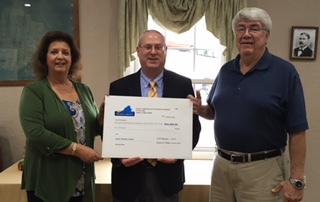 VCEDA Executive Director/General Counsel Jonathan Belcher presents a ceremonial check representing the $50,000 grant award by VCEDA to the Heart of Appalachia Tourism Authority. Accepting the check is Heart of Appalachia Tourism Authority Executive Director Kitty Barker. VCEDA closed an up to $50,000 grant on Oct. 26 to the Heart of Appalachia (HOA) Tourism Authority to be used to help market tourism opportunities in the seven-county, one city coalfield region. Heart of Appalachia plans to use the funds to launch a major marketing campaign to increase tourism visitation, particularly overnight stays, to the tourism businesses and attractions in the region. The campaign concentrates on outdoor recreation products, to include the creation and development of new mapping for hiking, equestrian, biking and paddling trails that will enable new landing pages, downloadable maps and descriptive content on the HOA website to increase users on existing trails. Read more about the grant to HOA. The Virginia Coalfield Economic Development Authority (VCEDA) closed on an up to $92,000 grant to be used to help finance the renovation, rehabilitation and improvement of the former Mutual Pharmacy property in Big Stone Gap. On hand for the ceremonial check presentation were, from left, Susan Cradic, executive director, Big Stone Gap Redevelopment and Housing Authority (BSGRHA); Jonathan Belcher, executive director/general counsel, VCEDA; George Polly, chairman, BSGRHA; and Steve Lawson, town manager, Big Stone Gap. VCEDA closed an up to $90,000.00 grant from the Virginia Coalfield Economic Development Authority (VCEDA) Tourism Capital Improvement Matching Fund on Oct. 10 to be used to help finance the renovation, rehabilitation and improvement of the former Mutual Pharmacy property in Big Stone Gap. The Mutual Pharmacy property served as an anchor of Big Stone Gap’s downtown from the 1950s until its closing in 2013, mere months before the movie ‘Big Stone Gap’ was filmed in the town. The Town of Big Stone Gap and the Big Stone Gap Redevelopment and Housing Authority have plans to renovate the two-story building to include dining and commercial space on the first floor and short-stay lodging to support local and regional tourism and community development efforts on the second floor. Six full-time and 25-30 part-time employees are projected within one year. Ten full-time and 30-45 part-time employees are projected within five years. Read more about the grant and plans for Mutual Pharmacy. Two historic theater projects that VCEDA has supported held significant events in late September. The Raven Theater in Tazewell County held its ribbon cutting and grand opening, and VCEDA closed a $40,000 grant to help finance the restoration of the awning-style marquee on the front of the historic Lyric Theater on Broad Street in St. Paul, Va. VCEDA provided $125,000, matched by the Virginia Tobacco Commission, for the Raven Theater project. The VCEDA board approved the Lyric Theater grant from the Tourism Capital Improvement Matching Fund to the Industrial Development Authority of the Town of St. Paul at its Aug. 16 meeting. In the photo at right, VCEDA presents a ceremonial check for the $40,000 grant for the Lyric Theater project. In the photo, from left, Kathy Stewart, Main Street Manager, St. Paul Tomorrow, Inc.; Jonathan Belcher, VCEDA Executive Director/General Counsel; Bob Harrison, Chairman, Town of St. Paul IDA. The town, IDA and other partners have been working to secure funding for the restoration project which is projected to cost more than $3 million. They have received funding approvals from the Appalachian Regional Commission in the amount of $300,000, and the Town, IDA, and St. Paul Tomorrow, Inc. are also supporting the project. The Raven Theater and Wilson’s Ice Cream Parlor in Raven in Tazewell County opened on Sept. 27 after an extensive renovation project. VCEDA provided $125,000 for the project which was matched by the Virginia Tobacco Commission. A number of volunteers were recognized and included Jack Ray, Jim Boyd and Rocky Horton. The event concluded with performances by the Jubilaires and Nathan Stanley. VCEDA Executive Director/General Counsel Jonathan Belcher, right, presents a ceremonial check to Breaks Interstate Park Superintendent Austin Bradley representing funds recently approved by VCEDA for the park. A grant for up to $92,000 from the Virginia Coalfield Economic Development Authority (VCEDA) to the Breaks Interstate Park was closed in September. The funds come from the VCEDA Civil Penalties Fund and will be used to finance improvements at the park, including the replacement of roofs, renovation of the park’s adventure outpost building, construction of a climbing wall and the purchase of equipment including new paddle boats, fishing kayaks and paddle boards which will be offered for rent at the park’s Laurel Lake. “The park commission appreciates the Virginia legislature and VCEDA for our access to the civil penalties funds which have allowed the park to do many improvements through the years which we typically would have not been able to fund through our traditional revenue streams. The new funding allows us to continue to add to and improve our offerings here at the park,” said Park Superintendent Austin Bradley. The park currently has nine full-time and 102 part-time employees and projects the addition of another two full-time and eight part-time jobs within two years. VCEDA Marketing Ambassador Charlotte Mullins (right in photo) and other regional representatives met with attendees at the 2018 National HUBZone Conference in Chantilly, Va.,Oct. 11-12. The two-day networking and educational summit consisted of government and industry match making with nearly 100 different agencies and prime contractors, training and educational seminars from top industry professionals, panel discussions and keynote speakers. VCEDA created special banners for the conference promoting the region’s suitability for state and federal contractors and the SWVA Hublink program that can connect HUBZone resident, technology-trained talent who can work virtually or remotely. Susan Copeland, VCEDA marketing coordinator, attended the Ridge and Valley Chapter of AUVSI’s (Association of Unmanned Vehicle Systems International) second annual symposium, “At the Intersection,” at Virginia Tech Oct. 8-10. VCEDA was also a lunch sponsor at the conference that examined the intersection of unmanned systems technology of human with machine, sensing with control, open architecture with secure software and communication, and with air, land, and sea. Susan Copeland also represented VCEDA at CORENet Global Summit in Boston Oct. 14-17. More than 2,500 attended the summit that incuded more than 200 speakers and 100 sessions on the latest trends and innovations in corporate real estate. One key session was the Economic Developers Roundtable featuring a panel that discussed growing companies considering a range of factors in making critical location decisions, going beyond the basics of choosing a site or building.